MFX are continually testing new designs and materials, in the quest for lightweight and durable products. 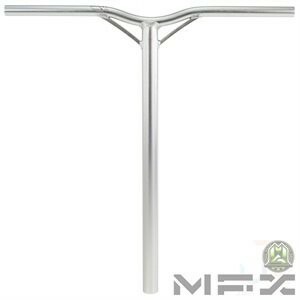 The MFX Aero Scooter Bars are manufactured using aircraft grade aluminium for superior strength. The MFX super lightweight, 25" high and 24" wide, Aero aluminium scooter bars are finished in three anodised colours. They not only look great but feature an internally reinforced cross bar for extra strength without sacrificing on weight. If you think that these bars may be too high for your child, don't worry as the bars can be easily cut down to suit by a specialist retailer or competent adult. It is not recommended to reduce the width of the Aero scooter handle bars. Due to the internal increased thickness of bar, it is not possible to fit bar ends after cutting.